Eighteen containers in assorted shapes and sizes on display in the corner of the room. Fourteen EFL teachers organized in small groups according to their L1: English, Russian, Hebrew, Arabic, French. Purpose: to show that the same objects will fall into different categories depending on the language you use to categorise them. 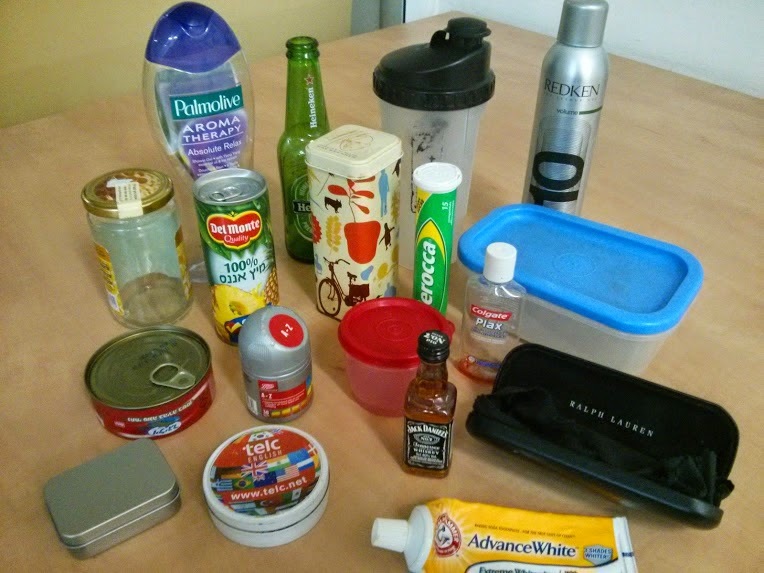 For example, the English-speaking group divided the objects which you can see in the picture into 8 categories: bottle (4), container (5), tube (2), can (2), jar (1), case (1), jug (1), case (1), canister (1). A British English speaker further divided cans into a can (soft drink) and a tin (of tuna). Hebrew speakers came up with 7 categories, with the can/tin of tuna ending up in the same category as “English” containers (including tupperware) while Russian speakers grouped the notorious can/tin together with the jar under the same title “banka”. Idea: not mine. It was inspired by a study conducted by Malt, Sloman and Gennari (2003) who tried to understand the relations between semantic categories among speakers of 3 languages: (American) English, (Argentine) Spanish and Mandarin Chinese. Only in their study they used 60 containers (I couldn’t carry so many from home). After sorting the objects into piles, the participants of the study were asked to name the objects (in their native language). The English speakers had a total of 7 names, i.e. all the objects were divided into 7 categories, while the Chinese group had only 5 categories. Interestingly, the Spanish speaking group ended up with 14 different names – some of their categories with only one or two objects in them. The most interesting thing about the experiment, however, is the degree of variation in distribution of names. For example, what the Spanish speakers described as “frasco” or “frasquito” (diminutive form) consisted of 28 items; most of these corresponded to what English speakers called “jar” (19 items), but also included what English speakers referred to as “bottle” (6 items) and “container” (3 items). Another group of six items Spanish speakers described as “bidon” was comprised of 3 “English” jugs, 2 containers and 1 bottle. Other bottles (English speakers identified a total of 16) ended up with different Spanish labels, for example, botella (3 items), mamadera (2 items) and envase (2 items). Curiously, this last, "envase” group also included 4 objects described by English speakers as “containers” and other sundry objects. The comparison between Chinese and English showed the same pattern. Unlike their Spanish counterparts, though, Chinese speakers had one large group of 40 items called “Ping2a ” which encompassed all jars (19) as well as 13 bottles and 8 containers. Another 3 containers were placed with 2 bottles and 5 cans into one category Chinese speakers labelled as “Guan4”. What does it all have to do with English language teaching? The study is published in the fascinating volume entitled Language in Mind which presents a modern take on - and perhaps an attempt to revive - the (weak) version of the theory of linguistic relativity. Also known as the Sapir–Whorf Hypothesis, the theory faced harsh criticism and was considered dead for most of the second part of the 20th century. According to the theory, the structure of one’s language influences one’s understanding of the world. In other words, language affects thought. Although Malt et al’s study doesn’t actually prove that language affects thought, it clearly demonstrates how different languages divide the world differently. And that’s what I wanted to show in my experiment: how because of carving up reality differently words rarely have an exact equivalent in another language. Even for concrete nouns, such as the ones describing the containers, semantic fields of L1 and English do not necessarily overlap. And if different languages do not “agree” on what categories different items should be assigned to, distinctions between how more abstract notions are expressed verbally across languages become even fuzzier. For example, English “convenient” and “comfortable” correspond roughly to the same word in Russian (“udobniy”), thus often leading to confusion and, inevitably, wrong word choices among Russian learners of English (*The sofa is convenient). The phenomenon when a word in a language has two (or more) equivalents in another language is known as "semantic split". Or take an example from Turkish: both "scenery” and “view” are rendered into Turkish as “manzara”. Semantic partitioning of the world may also be different in different language due to cultural or historical reasons. For example, many languages do not distinguish between “to blame” and “to accuse” or “to be accused” and “to be guilty”. Word meanings are a messy area. The lack of direct correspondence between L1 words and L2 words is something beginner learners often find difficult to come to terms with. But we, language teachers, should disabuse them of the notion that an English word = (is equal to) an L1 word relatively early on. As much as L1 provides initial support when clarifying meaning of a new word, it is also important to get across to learners how the English word may behave differently from its L1 equivalent in relation to the meaning it denotes and other words it is associated with, i.e. co-text. Do you have examples of similar messy relationships between certain words in English and your students’ L1? Do you do anything in class to draw your students’ attention to the fact that semantic fields of two words – English and its L1 equivalent – rarely overlap 100%? Malt, B.C., Sloman, S.A. & Gennari, S. (2003). Speaking vs. thinking about objects and actions. In D. Genter & S. Goldin-Meadow (Eds.) Language in mind: Advances in the study of language and thought (pp. 81-111). Cambridge, MA: MIT Press. What an absolutely fascinating discussion Leo. I can't answer your questions at the end apart from to say that I try to give the learners examples of where direct equivalents don't work. Russian, together with Italian and Hebrew, indeed distinguishes between two shades of blue and 'sees' them as different colours. I was sure there was a study on colour naming in different languages in the same book I referred to in the post, but having had a quick flick through it now I couldn't find it. I must have seen it somewhere else. The book does mention Dani, however, a language spoken in Papua New Guinea, which has only two colours: warm and cold. Warm includes brown, red etc. Generally, colour naming is a common testing ground for the theory of linguistic relativity. bank can mean different things - I once had difficulty remembering that a "money box pig" is actually called a piggy bank. And once I failed to understand the punch line of a joke because I assumed that an autruche was a person who lives in Autriche. Names for members of the family vary in complexity and usually seem to be more complex in English. For example, French would distinguish between male and female cousins. Chinese is very complex in terms of relationships distinguishing between older and younger brother and sisters. Other relations like maternal and paternal grandparents are distinguished. Thank you, Patrick. It's even more complicated in Turkish - with different words not only for paternal/maternal relatives but also elder/younger brothers and sisters. Great post, Leo. I love this kind of stuff. Another example for you. In Polish 'buty' (pronounced booty) means shoes as well as boots. Thanks, Rachael. Sorry I didn't see it earlier. During my time in Kiev a student wrote that she had "accidentally married" the wrong man. It took ages to work out that actually she had "inadvertently" married the wrong man. The distinction is subtle, but caused quite some confusion! Thank you, Richard. "Inadvertently/accidentally" is a great pair of near-synonyms to discuss in class with advanced students. I found this part of the article to be particularly interesting. I as of now do not have a class that I teach so I cannot answer your other questions.